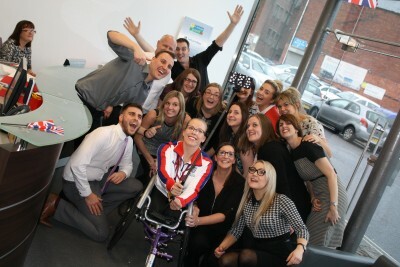 Paralympic and triple world champion Hannah Cockroft has spoken of her delight at being sponsored by her local company for the seventh year running and how she values the support. 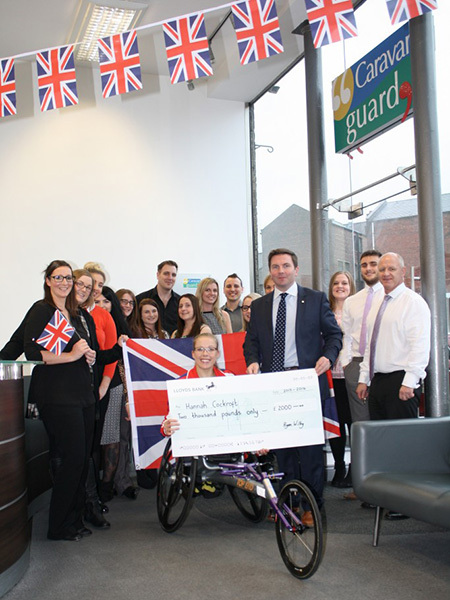 Halifax-based insurance specialist Caravan Guard presented wheelchair racing Hannah with a cheque for £2,000 to see her through to the 2016 Rio Paralympics in September. Hannah said sponsorship was really important to every athlete. The sponsorship money helps Hannah to pay for her racing wheelchair, as well as replacement wheels, tyres, gloves, speedometers, physio and travel expenses to competitions. Hannah also spoke about how her life has changed beyond her wildest dreams and how she loves to relax by hanging out with friends, shopping and the cinema. To view Hannah’s interview in more detail click the video panel below. Managing Director of Caravan Guard, Ryan Wilby, said it was an honour to continue to support a local hero. “We were delighted Hannah took time out of her busy schedule to come and visit us and we’re proud to have sponsored her throughout her racing career,” said Ryan.